Yes you can love solar power. It's free, clean and available year round. 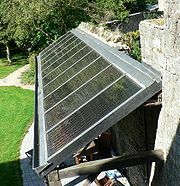 The costs of solar systems has gone down by 80% over the last twenty years, and this makes it available to everyone. There are different options available and it's important to understand the benefits and costs of each one. There are two basic systems available the "grid-tie" system, and the "off-grid" or stand alone system. In the grid-tie system your home is connected to the local power grid, but has a solar system installed. With this system the solar cells collect energy and convert it to DC (direct current) electricity. You then need an inverter to change it to AC (alternating current) which can then be used in the home. A great thing about this system is that any energy you don't use is fed back into the grid, and your power meter runs backward. This builds a credit with your power company called "net-metering". The major benefit of the grid-tie system is that you do not need expensive batteries to store power, the grid is your storage area. Without battery or generator backup for your grid-tie system, when there is a power outage you will also loose power. To maintain some of your electric requirements like lights, refrigerator, TV, well pump, or computers, many homeowners choose to install a grid-tie system with a battery or generator backup. Adding the backup into the system requires more components, is more expensive, and lowers the system’s overall efficiency; however, if you have regular power outages or have critical electrical loads then having this type of backup system may be necessary. What can Solar Power Do For Me? Using this system reduces the need for fossil fuels, because it will actively reduce your reliance on the local grid. Most of the energy we buy from the power company is produce by coal, oil, or a nuclear facility. While some might argue that nuclear power does not involve fossil fuel, it still uses vast amounts of water and non-renewable radioactive metals, this makes it unsustainable over time. It will also help on a personal level by reducing or eliminating your utility bill each month. There are many other intangible benefits. A well designed solar powered home has more value on the marketplace for resale. You will be able to sell your house more easily, and for a whole lot more when you tell your buyers that they don't have to pay for electricity. For this kind of system to work well, it needs an unobstructed view of the sun. In most of the northern hemisphere, the panels are placed on a roof facing south. It is also good to remember when setting up the system that the angle must be the same as the latitude of placement. In other words, if your home is at 29 degrees N latitude, then your panels must be at a 29 degree angle to the sun. This allows the solar power panels to absorb the most amount of energy year round. Be sure that the panels are never shaded at any time. If just one module is shaded it can reduce your power output by half. There are many ways that you can use it in your home even if you don't want to add it to the power grid. Solar hot water heaters are great money savers. A good unit can save your over $500.00 per year over an electric system. You can heat your pool, or heat your house. A solar powered hot water system is very simple. You install solar panels on your roof, the sun heats the panels, and the solar collectors heat a fluid int the pipes held in the interior of the panel boxes. This fluid is transferred to the house where it heats water in a storage tank. The system can include a pump which circulates the transmission of the fluid from the roof to the water tank and back again. In areas where freezing is not an issue, systems can heat your water directly. The average cost of installing a system is between $20,000.00-40,000.00. This cost includes the price of the panels themselves and the labor costs involved. There are government rebates available that will help with the cost, and there are tax rebates also for installing a system. Go to this website to find a list of local incentives. http://www.dsireusa.org. And there is a bright side, in addition to all of these incentives, you can build your own for about $200.00. As things stand, our environment is in the toilet, unless we all do our part to save our planet. Why not give solar power a try?